In sub-tropical KwaZulu-Natal, December brings the beginning of the wet season. Life restoring rain has seen our conservancy Ukuwela blossom into life after a dry winter. Last week, Ukuwela's red soil erupted with thousands of flying insects! These 'flying ants' are in fact termites (not ants at all) on their nuptial flight to reproduce, providing a feast for birds and other wildlife. Watch the nuptial termites in flight, being preyed on by stunning, hungry violet backed Starlings! Be sure to turn on your sound to hear the bird songs from Ukuwela. For most of us, termites bring to mind a reputation as a pest, and dreaded threat to wooden homes and crops. Not for Wild Tomorrow Fund entomologist Barbara Wright who has a special love for insects and appreciates the important role they play in healthy ecosystems, breaking down dead plant material, pollinating crops, improving soil health and providing food for other animals. "Termites are one of the most important insects in the natural environment. Removing them from the ecosystem will likely cause it all to collapse" said Barbara, who recorded a fascinating moment last week on her iPhone: the nuptial flight of the termite. "Every year around this time, millions of termites explode from their nests in a frenzied nuptial flight that is vital for ecosystem health. We watched hundreds of swallows and around thirty yellow billed kites in breathtaking aerial displays feasting on them," said Barbara. "We even had two large fish eagles on the ground eating as much as they could". There are more than 2,600 known termite species in the world. With over 660 species, Africa is by far the richest continent for termite diversity. Termites (Blattodea), similar to bees from the unrelated order Hymenoptera, live in highly structured colonies where individuals have specific roles. The King and Queen termite are the 'reproductives', mating for life and producing a family of workers, soldiers and alates (termites with wings) for their colony. Termites use the gift of flight to reproduce. The nuptial flight, meaning the mating flight, usually occurs once per year and is the most important phase in the lifecycle of a termite. This special moment often occurs simultaneously for multiple termite colonies, intriguingly coordinated and triggered as a response to temperature, humidity, wind conditions and the time of year, ensuring different colonies can meet and swap genes. As the winged virgin queen emerges from her colony for her nuptial flight, she releases pheromones to attract her future king and mate. She plays hard to get, flying a dance of avoidance to ensure that she chooses the fastest and fittest male termite to be her mate for life. When the lovers meet, their wings immediately break off, and they scuttle off together to find a new home (while avoiding the beaks of hungry birds!). Once impregnated, and safely a central part of her own colony, the queen termite can lay up to 30,000 eggs a day – quickly populating her nest with a community of workers, soldiers and alates to continue the cycle. With such a rapid rate of reproduction, it is amazing that the world is not overrun with termites! Their populations are controlled in nature by predators- almost everything eats them. 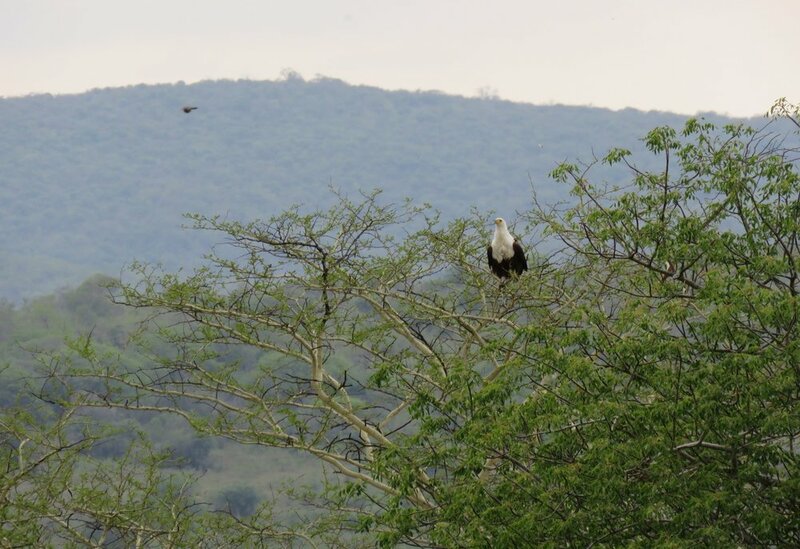 On Ukuwela that includes many species of birds including swallows, guinea fowls, even fish eagles and crowned eagles, bushbabies, mongooses, aardvarks, honey badgers, reptiles, arachnids, ants and other predatory insects. It is a time of plenty for these predators who gorge themselves on the all-you-can-eat buffet, making it a perfect time to raise and feed offspring. "Many termites dont make it, but there are more than enough who get away and start their own colonies", said Barbara. Humans also have an appetite for crunchy termites. In Uganda and Zambia, they are considered a delicacy and are dished up fried, steamed or dried. Termite mound soil is surprisingly nutritious, particularly for women and children, acting as a natural mineral supplement, similar to the more familiar ingestion of salt. Elephants love termites too, feeding more intensely on trees that grow on termite mounds due to the higher concentration of nutrients these trees contain, thanks to the termites at work below them. Traditional indigenous farmers across Sub-Saharan Africa also understand the value of termites to their crops, enhancing soil health. Termites are also firefighters for ecosystems, breaking down up to 100% of forest litter which translates to tons of litter removal every year- a dramatic reduction in 'fuel load' for fires while reducing fire intensity. Termites are small yet fascinating, socially complex helpers of ecosystems, an incredibly important part of the web of life on Ukuwela.